Wye Valley Butterfly Zoo01600 890360work ZooWye Valley Butterfly Zoo offers you the wonderful opportunity to walk with butterflies as they fly amongst the beautiful tropical plants and be at home with these lovely creatures. You can walk with butterflies from around the world. 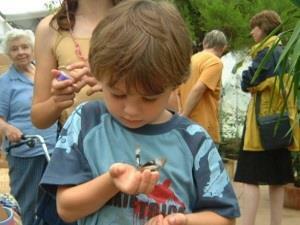 Wye Valley Butterfly Zoo is indoors, it’s tropical and it’s teeming with exotic butterflies. Living butterflies fly around as you discover their fascinating lives in close-up. They’re amazing. See for yourself every stage of their life-cycle: Egg, caterpillar, chrysalis and some of the world’s most beautiful butterflies. The species we breed in our zoo have fascinating survival strategies, and there’s loads to learn. Bring a camera for superb wildlife photography. The Zoo shop has wonderful gifts, butterfly plants, and books on wildlife. It’s a real treat. Wye Valley Butterfly Zoo offers you the wonderful opportunity to walk with butterflies as they fly amongst the beautiful tropical plants and be at home with these lovely creatures.